As I said earlier in my previous post Chinese food served in China differs from what is served outside the country as it depends on the local ingredients available and the needs of the customers. The recipe that I have described here is an Indo-Chinese version in which the use of green/red chillies gives the required spiciness. This used to be one of my mom's speciality dishes and a fight ensues between my brother and I as to who gets the largest serving! The common method of preparation is adding eggs and cornflour to marinated chicken pieces which are then deep fried in oil and later added to the prepared sauce/gravy. Since I didn't want to go for deep fry I stir fried the marinated chicken. Hence I haven't used eggs and cornflour for the marinade but you may prepare it as you wish.Also in traditional Chinese preparations peanut oil is used for cooking but since its expensive for daily use the oil used differs. The use of different sauces to prepare the gravy does impart colour to it but if you need to make the dish more appetizing (especially on occasions where you are throwing a party or having guests in your home) you might need to add food colour. This dish goes well with stir fried rice. Marinate chicken pieces with the ingredients for marinade. Keep aside for an hour. In a large pan stir fry the marinated chicken pieces till cooked. You may use any method for cooking chicken. While stir frying drain the juices coming out from chicken and keep aside. Remove the cooked chicken pieces from pan. In the same pan used for cooking chicken heat about 1 tbsp oil at medium heat. When oil is hot add minced garlic and ginger. Saute till the raw smell goes and till you get the aroma of spices. Add chilly and saute for few seconds. Add chopped green pepper, celery and half of chopped spring onions .Saute for a minute. Now add ground pepper, soy sauce, chilly garlic sauce, vinegar, salt, food colour and MSG. Mix well. Add chicken broth, stir well and bring to a boil. If you need more gravy you may add more chicken broth or water. When the gravy has started boiling add the cooked chicken pieces and reduce heat. Saute for few minutes. To thicken the gravy add about 1 tsp of cornflour at a time stirring well until the gravy attains the desired thickness. Care should be taken during addition of cornflour because too much of it would make the gravy very thick and reduce the taste. Remove from heat and garnish with the remaining chopped spring onions. 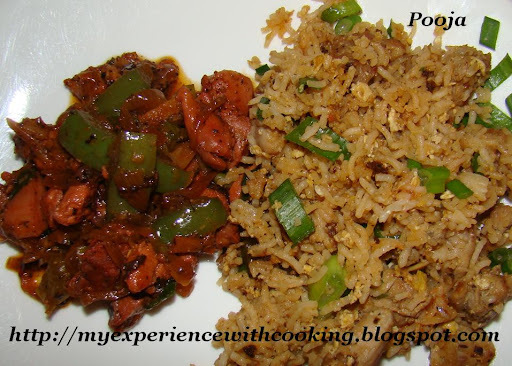 Enjoy with stir fried rice.